Newly renovated one bedroom fully self contained beach cottage, includes fully appointed kitchen and all linen provided. Three minute walk to Point Roadknight Beach. Enjoy your own BBQ area and partly undercover deck which overlooks a courtyard within a garden setting and includes garden produce to pick.. Enjoy a hot outside shower after the beach. Our five star Cottage is one and three quarter hours drive from Melbourne City or Melbourne Airport via freeways. Other Anglesea beaches and the Anglesea River close by. 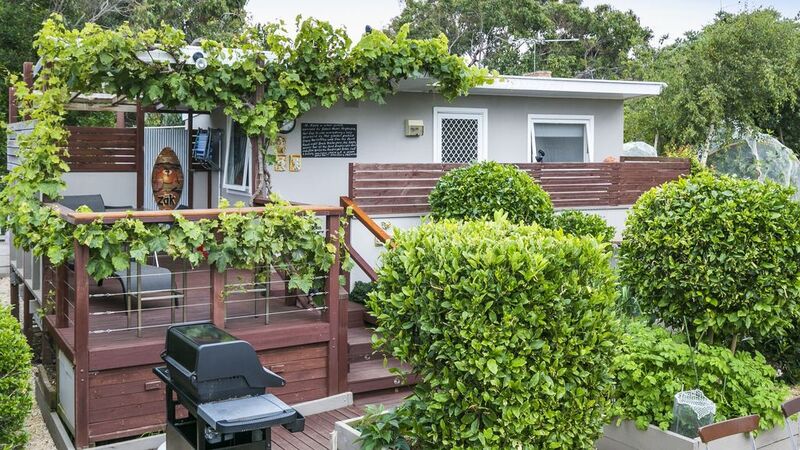 Coastal walks, fishing, boat ramp 300 meters, kayaking, surfing, the famous Anglesea Golf Course (play amongst the Kangaroos), restaurants, shops and hotel close by, bowling club, tennis courts, great mountain bike trails. Great place for a short break away to explore Anglesea and everything the area has to offer. Only a short walk to the beach and the coastal walk to the town shops is a must do. Barry and Ella are very nice hosts to meet and chat to and respect your privacy. The cabin has everything you need for a short break. Thank you again. Great location, perfect little cottage, and loved the courtyard with with home grown herbs!!!!. Was a great relaxing time away. Thank you for letting us stay! Has everything needed to relax & enjoy time by the beach. my 3rd time in this wonderful cottage. Close to beach, clean, cozy and extreme friendly hosts. My 3rd time in this wonderful cottage! Walking distance to beach, clean, cozy and extreme friendly hosts! Susi is becoming a regular. Its great to see her utilising all of the facilities and activities which the Surfcoast has to offer. Looking forward to Susi's next visit.